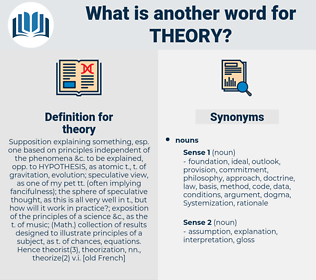 What is another word for theory? principles, notion, paper, principle, proposition, premise. pointed, addressed, Discussed, Dealt, made. hypothesis, thesis, theoretical, Theorizing, dissertation, argument, assumption, reasoning, theorist, logic, doctrine, rhetoric, supposition. certainty, disbelief, proof, information, knowledge, reality, truth, fact, calculation, measurement. You've got a theory, of course? It's all theory so far. structural anthropology, theory of preformation, structuralism, reductionism, blastogenesis, economic theory, field theory, atomic theory, egoism, preformation, patchwork, holism, atomistic theory, Atomism, jumble, hodgepodge, holistic theory, structural sociology, atomist theory, scientific theory. law, theory, law of nature, hypothesis, possibility.